I can attest that summer camps, jobs, and college all come too quickly for our kids, and once we realize that, the race is on. We try to outrun the years and soak up every last bit of our time together. One day, after attending a school program for her oldest child, Bethany came to that same realization herself–that she had a limited amount of family time left with her little ones. 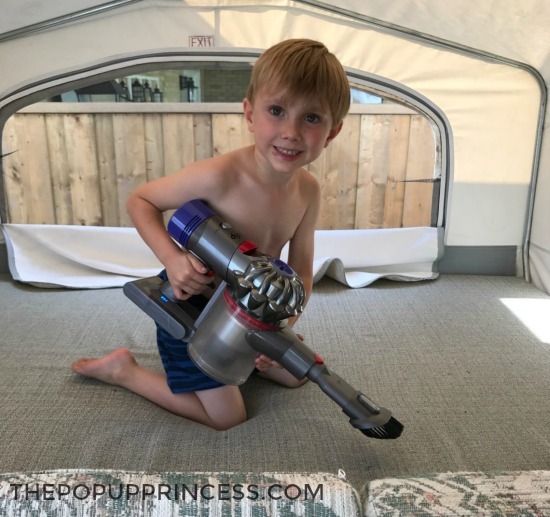 She had an epiphany of sorts, and she and her family came up with their “camper cottage” idea as a way to make the most of her children’s fleeting youth. You can read about her story here. And so, Bethany and her family acquired a used Palomino pop up camper. 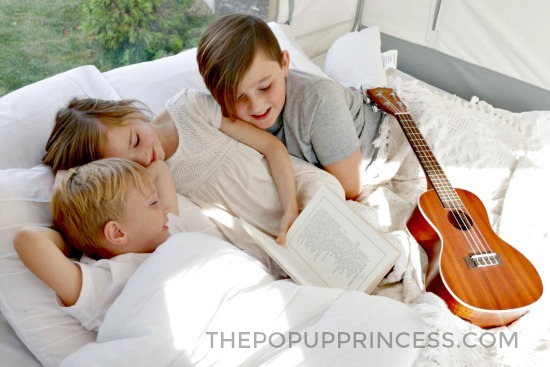 They first did a thorough cleaning of their new little pop up–and this makeover was a family affair. Everyone got involved. I just love that! 🙂 They vacuumed, scrubbed, and sanitized every square inch of the trailer. Then they got to work taking everything apart. They removed the countertops, cabinet doors, and even the kitchen sink. Bethany used her favorite white paint for her cabinets. In fact, she loves it so much, she had used it on her kitchen cabinets at home, too. The color was actually a more creamy white, but once she pulled in her white bedding, she realized her favorite paint now looked too yellow. A lazier woman (ME! 😉 ) would have changed the bedding out, but Bethany actually sanded all those cabinets down and repainted them a brighter white. 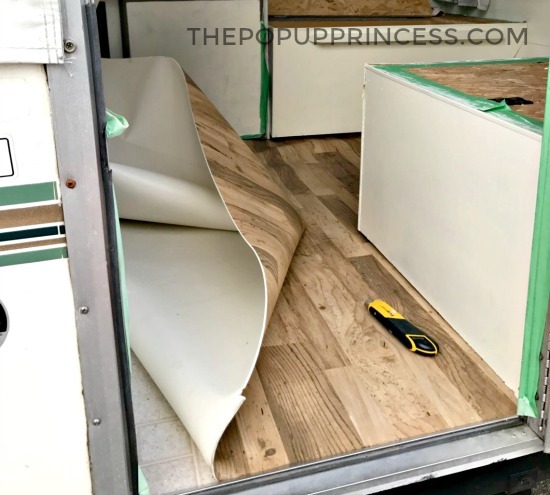 Then Bethany purchased sheet vinyl from Lowe’s to replace the flooring. She loves the way it looks like plank vinyl without all the seams, and it adds a little extra cushion underfoot, too. Isn’t it gorgeous? When Bethany and her husband started putting the kitchen area back together, they realized they had a little bit more freedom to play with the layout. Because they had removed the sink and replaced the countertops with a faux marble laminate they ordered from a local supplier, they decided to move the sink over a bit to give themselves a bit more counter space in the kitchen. They also added a vinyl backsplash with the look of subway tile. It looks sleek and modern, and the new layout is much more convenient. 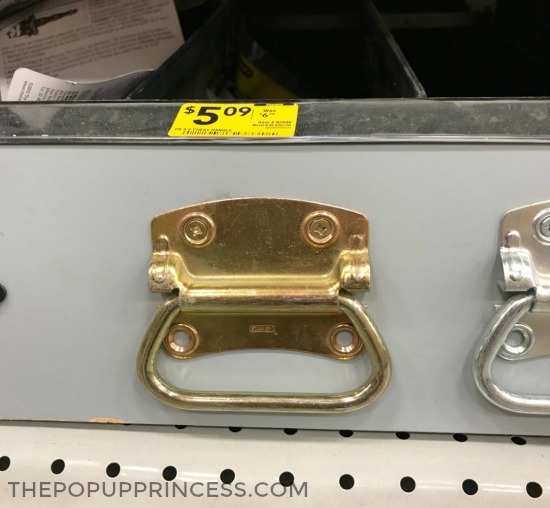 Bethany bought industrial-style hardware, purchased in the outdoor hardware aisle, to replace her cabinet pulls. 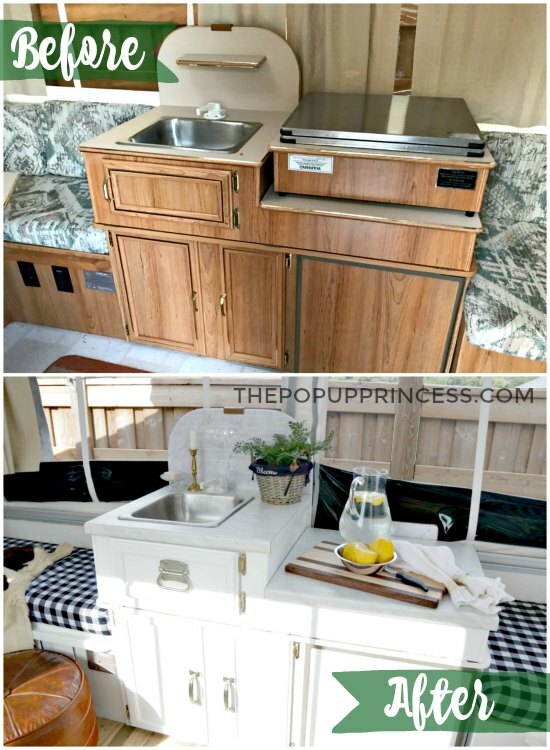 Because everything was gold, she gave the existing hinges a coat of gold spray paint so it would match the rest of the hardware and give the camper a cohesive feel. She chose white bedding, which is just gorgeous and will be easy to bleach if it gets too dirty. 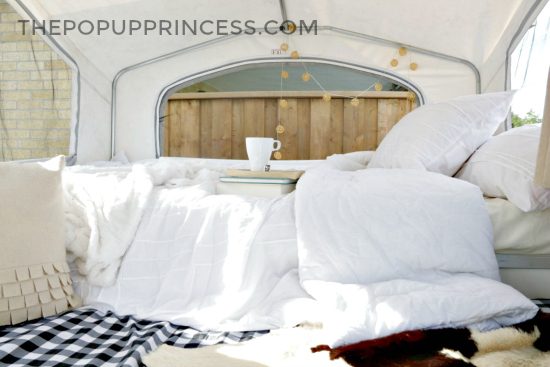 You can read all about her bedding and fabric choices on her blog here. 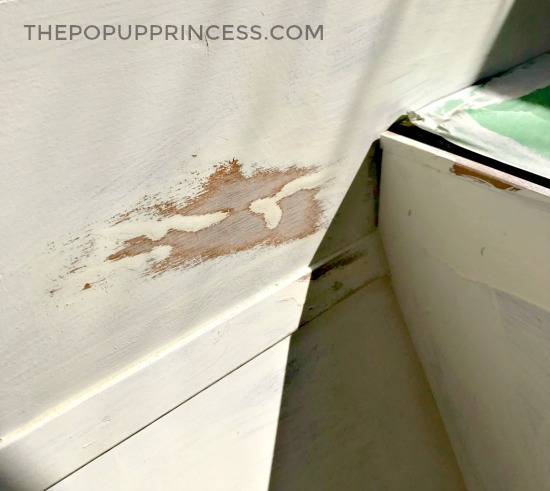 There are tons more pictures on Bethany’s blog, so if you are as infatuated with her remodel as I am, you will definitely want to head over. 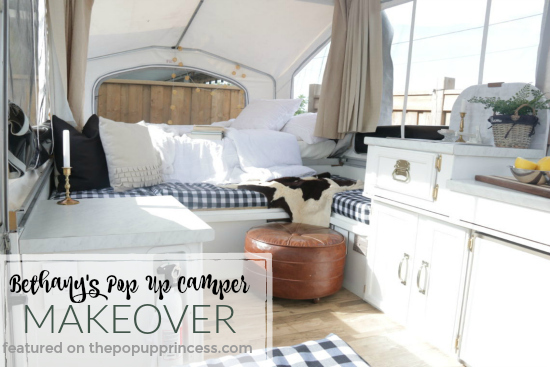 Remember when I said this little camper makeover was a family affair? It really was! Bethany’s sweet mom took on the camper cushions and covered them in a gorgeous black and white buffalo check print. I love how they pop against the white cabinets and bedding. 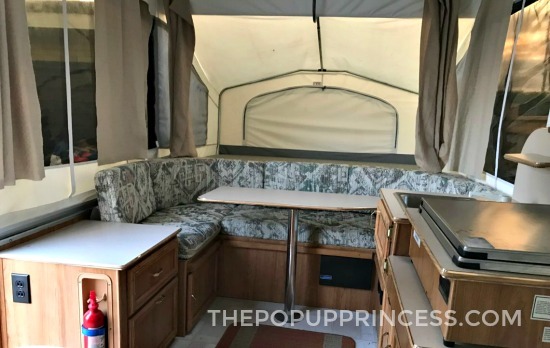 She disliked the traditional pop up camper tables that came with her Palomino, so Bethany removed them. She may eventually replace them, but at the moment the family is really enjoying the extra space. 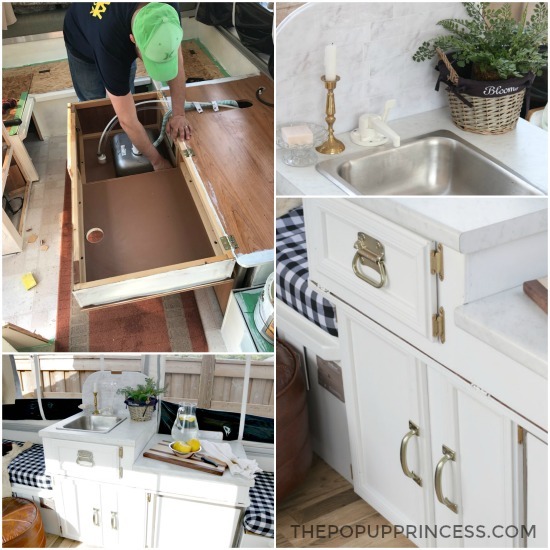 Removing the tables makes the camper feel more open and airy, and combined with the white cabinets and light flooring, their pop up really feels quite spacious. Bethany was so pleased with how it all turned out, and it isn’t hard to see why. 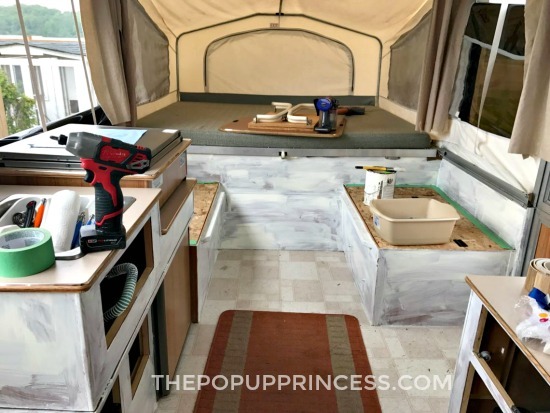 She was brilliant with all the finishes and the little details, and I can hardly believe it is the same camper! Their new camper cottage feels like home away from home for Bethany and her family. She will often find the kids lounging on the beds or playing a game of cards together inside. It is the perfect little retreat away from the hustle and bustle of daily life, and the perfect place to soak up those fleeting moments with her kids. Mission accomplished. So beautiful! I completely understand the fleeting moments as kids grow up! 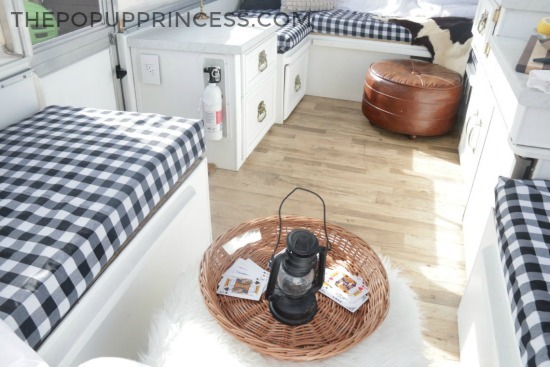 We are planning a lot of white in our camper redo as well. I find it so calming and surprisingly, easier to clean! Cleaning products these days make white completely doable! Can you tell me where you got your white fire extinguisher? This is the light, clean and airy look I’m going for as well. Too many people are scared of white. I’d rather see the dirt so I can clean it, not hide it. I also noticed you didn’t use the cushion backs for all the seats? I’m just wondering what your reason was? I like it, it gives a more modern updated look and still so cozy. I also can’t stand my pole table and thinking of taking the whole dinette (seats and table) out and just putting 1 seat back flush against the wall for more room. We never use the table because we’re always outside but we do lounge around inside. Well thank you for sharing!! You did an amazing job!! !